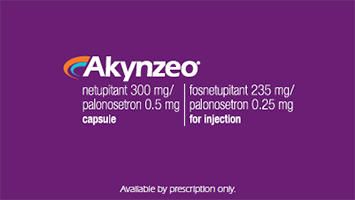 AKYNZEO is a prescription medicine that is used in people to help prevent the nausea and vomiting that happens right away (acute) or later (delayed) with certain chemo medicines. AKYNZEO is a combination medicine. It contains two medicines: PALONOSETRON and NETUPITANT or FOSNETUPITANT. These medicines are from two different classes. Two different classes means AKYNZEO works on two different pathways in your body to prevent nausea and vomiting.